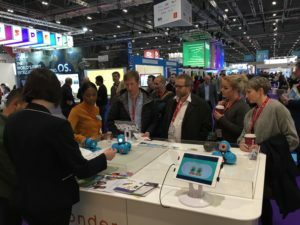 We’d like to thank the #Digiladies who stopped by our booth at BETT 2019! They are awesome and said they were going to create a Cue robot dance party. We hope to see it on Facebook one day. We were honored to receive the BETT 2019 award for ‘Primary Content’. And, thank you to everyone who visited our booth. We loved meeting all of you and hope you enjoyed learning about our robots, curriculum, and programs.